Backing up data is a critical part of any IT management role. And in order to make sure your systems stay protected, you need to think carefully about all of the business issues that affect your data management requirements. One of the toughest business requirements to manage has to do with long-term data retention. Most backup processes rely on a simple rotation schedule. Every day, the IT admin makes a backup copy and takes it to a safe remote site. After 7 days of backups like this, they take the oldest backup media (tape, hard drive, etc…) and recycle it for use as the most recent backup copy. This cycle continues in perpetuity, so that there are always 7 historical daily backups on file. Since the first media device to be used is also the first media device to be wiped out and recycled, this is often called FIFO or First-In-First-Out. Since this is the most basic form of backup, it’s very likely that you know someone who uses this rotation scheme. FIFO is excellent for ensuring point-in-time recoverability for short-term data backups. But there are many scenarios – such as is the case with legal liability protection – where you would need to keep a very large number of historical backups in rotation. Using the FIFO model outlined above you would need nearly 2500 backup devices in order to retain 7 years worth of backups. This is an expensive and inconvenient way to store seven years worth of backups. In order to get around this problem, we need to think strategically about our backups. One thing we know is that data can have different levels of importance based on certain predictable factors. In fact, – as data gets older – we know that it usually becomes less valuable. Using this knowledge, we can expand upon the FIFO rotation scheme in such a way that we can efficiently adhere to these long-term retention requirements. 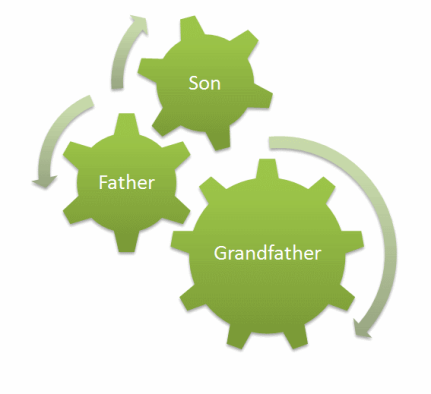 The Grandfather-Father-Son backup rotation is a methodology that can efficiently store large amounts of older data backups while also ensuring that recent backup can be rolled back to a previous point if needed. With the GFS approach, you would perform 7 daily backups using the First-In-First-Out approach outlined above. But at the end of every week, you would also preserve a weekly backup for longer-term retention. These weekly backups are usually done on a 5 week cycle. At the end of this five week cycle, a monthly backup is copied and permanently preserved. This number is significantly smaller and easier to manage than the 2500 backups that would be required for a traditional backup cycle of this length. Although methods vary slightly from one technician to another, this is a very basic and general overview of how the GFS methodology works. 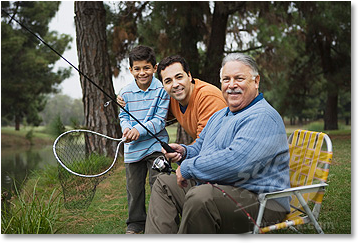 The Grandfather-Father-Son backup schedule is currently the most popular backup rotation system for corporate backup. In another article, I’ll discuss the progressive system in more detail. But for now, the Grandfather-Father-Son rotation is a simple way to efficiently store long-term historical backups without having to completely redesign your current backup process. Storagepipe offers online backup that helps businesses securely and efficiently store long-term historical copies of their backups. It needs to have a bit more information on the Grandfather-Father-Son Backup.